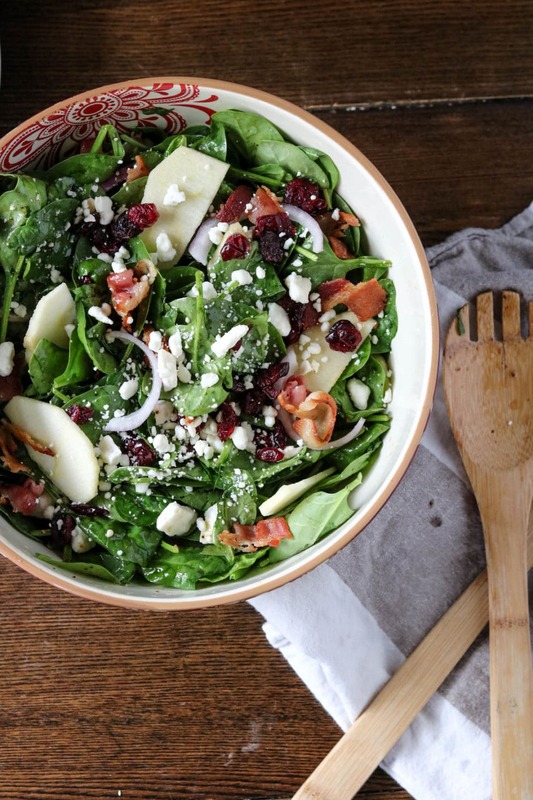 This apple cranberry spinach salad is one of 12 Thanksgiving recipes I’ll be sharing with you over the next 12 days. If you’re one of my newsletter subscribers, you know that Wanderlust and Wellness is bringing you one incredible Thanksgiving meal plan! Over the next 12 days I’ll be sharing a full Thanksgiving menu, including 1 main dish, 1 salad, 8 sides and 2 desserts. All healthier, Paleo approved options but MIGHTY tasty! I’m also going to throw in a full shopping list and meal planner on day 12! You won’t want to miss this! Today is November 1st, therefore I’m bringing you the first recipe of the meal plan, this apple cranberry spinach salad. Where do I start with this salad?? 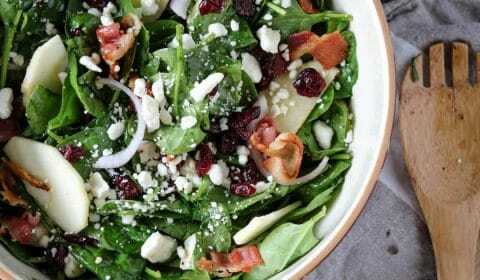 It has crispy bacon, sweet dried cranberries, fresh crisp apples, feta cheese, with a tangy homemade vinaigrette dressing. There’s so many flavors and when combined they make the perfect combination. 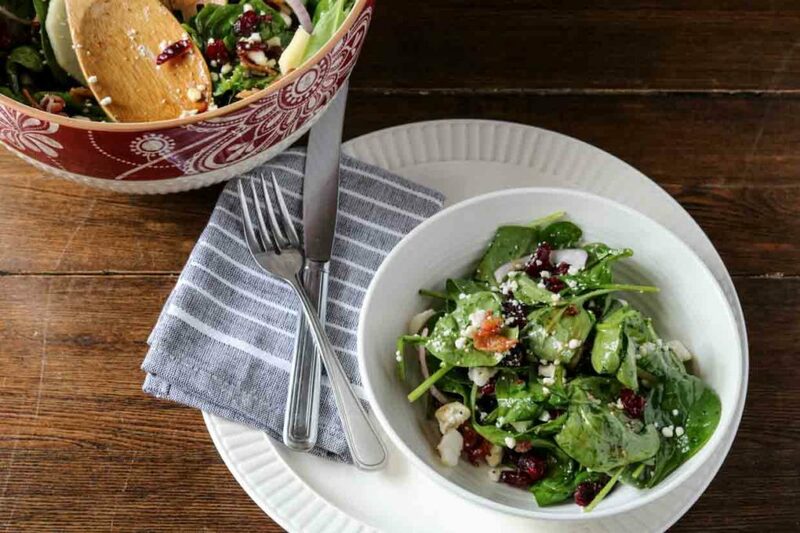 This sweet and tangy salad is the perfect starter for your Thanksgiving dinner. Skip the bottled dressings and plain ol’ iceberg salads and wow your dinner guests with this apple cranberry spinach salad. And don’t be afraid of adding fruit to your salads! I know you have all heard me tell you before how I used to avoid fruit in salads like the plague. I was even hesitant of adding the apples into this salad but I wanted a crisp ingredient to replace the usual crunchy croutons. I am so glad I did. 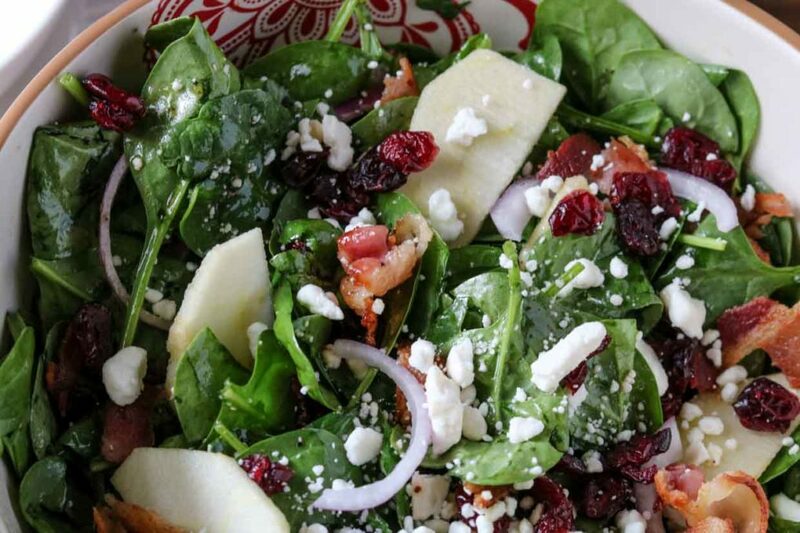 The apples were absolutely delicious in this salad. I’ll also be posting a full shopping list and meal planner on Saturday, November 12th. Cook bacon until crispy, set on paper towel lined plate to cool. In a small bowl, combine dressing ingredients and whisk together, set aside. Rinse spinach prior to use, then add to a large salad bowl. Add in cranberries, apple slices, red onion, feta. Crumble bacon pieces over the top. 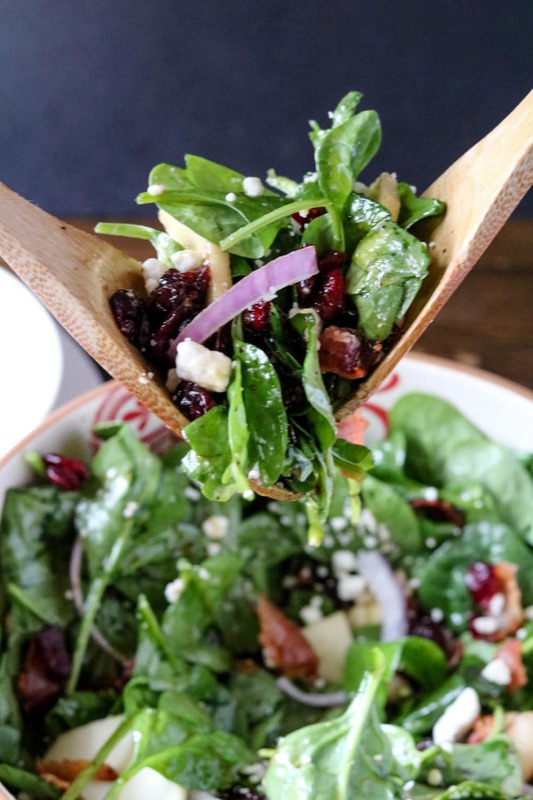 Using salad forks, toss all ingredients together. Right before serving, add dressing to salad bowl and toss again until well coated. This looks SO good! <3 Such a great idea to provide a paleo thanksgiving menu for your readers too! Thank you, Laura! My goal is to make it easy and accessible to serve up a healthier Thanksgiving meal! Gah that is one awesome feast you’ve got coming!! Way to go.